One of the benefits (curses?) about having a food blog is that we tend to obsess about focus on our diet — specifically, what’s for dinner each week — a lot more than we would otherwise. Prior to starting this little blog, we still planned our weekly menus, but gravitated mostly toward easy favorites with convertible leftovers (we often had red meat twice per week, since beef is easily parlayed into two different meals.) These days, we tend to focus more on filling our weeks with variety, including at least one seafood and/or vegetarian dinner per week if possible. We still eat red meat (and likely always will) and appreciate getting two different and delicious dinners out of a single cut of beef, but we feel more healthy when we balance out the meaty side with fish and veggies. While we have many seafood favorites to choose from each week (parchment fish, shrimp & orzo, fish tacos and Cajun shrimp, to name a few), it can be difficult to find vegetarian dishes that are both delicious and filling, and don’t make us feel like we’ve just finished our salad course and are longing waiting for the (meat) entree. This hearty pasta dish is all the main course we could want, with earthy and “meaty” flavor from the mushrooms and a tangy, creamy sauce made with sour cream and goat cheese. Although, full disclosure — the recipe includes beef stock and therefore, it’s not strictly vegetarian — the dish has less calories and fat than the more traditional beef stroganoff, without sacrificing any of the flavor. The original recipe yields enough for 6-8 people, so we cut the ingredients in half, starting with 2-3 portabella mushrooms. Remove and discard the stems and cut the caps into about 1/2 inch slices. Chop 4-6 green onions, separating the white parts from the green parts. Bring a pot of salted water to a boil, add about 6 ounces of wide egg noodles (we used whole wheat noodles) and cook until al dente, using the package directions as a guide. Melt 1-2 tablespoons butter in a large skillet over medium-high heat. Increase the heat, add the mushrooms and 1/2 teaspoon Kosher salt, then saute until the mushrooms begin to soften and release their juices — about 5-6 minutes. Add the white parts of the green onions to the mushrooms and saute for 2-3 minutes. Sprinkle about 1 1/2 teaspoons of flour over the mushrooms, stir and cook until all the flour disappears — about 1-2 minutes. Add 3/4 cup beef broth to the skillet and scrape up any browned bits from the bottom. 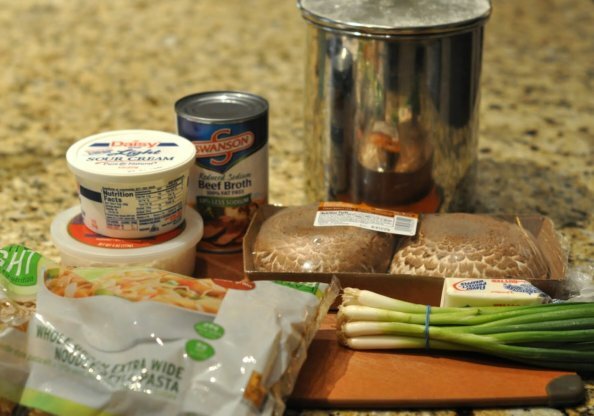 Bring the mushroom mixture to a simmer and cook over medium-low for 10-12 minutes. Add 1/2 cup sour cream, 1/4 cup goat cheese (we used the crumbled kind) and 1/4 teaspoon black pepper to the mushrooms and stir to combine. Partially cover the skillet and bring to a simmer so that the mixture is heated through — about 2-4 minutes. Add the drained noodles to the skillet and stir everything together. Taste and season with salt and additional black pepper as needed. Garnish the stroganoff with the chopped green parts of the green onions and serve. We served ours with a simple side salad for a delicious and balanced vegetarian (a little beef broth notwithstanding!) meal.